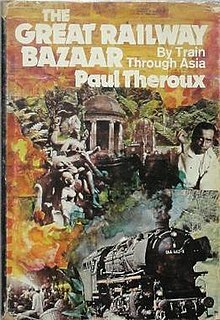 The Great Railway Bazaar: By Train Through Asia is a travelogue by the American novelist Paul Theroux, first published in 1975. It recounts Theroux's four-month journey by train in 1973 from London through Europe, the Middle East, the Indian subcontinent and Southeast Asia, and his return via the Trans-Siberian Railway. Many people consider it a classic in the genre of travel writing. The first part of the route, to India, followed what was then known as the hippie trail. It sold 1.5 million copies upon release. In the book, Theroux explored several themes such as colonialism, American imperialism, poverty, and even ignorance, among others. These were embedded in his accounts of sights and sounds he experienced as well as his conversation with other people such as his fellow travelers. It included elements of fiction such as rich descriptions of places, situations, and people, reflecting the author's own thoughts and outlook. Contemporaneous reviews noted how his background allowed him the breadth of insights to authoritatively describe people even when there are instances when he committed ethnic generalizations. Prior to the publication of The Great Railway Bazaar, Theroux lived in Africa, Singapore, and England. I could think clearly on the London trains and when, on the rare occasions, I travelled out of London – on the Exeter line via Sherborne, Yeovil, and Crewkerne, to visit my in‑laws, or on the Flying Scotsman on a journalistic assignment, my spirits revived and I saw with clarity that it might be possible to conceive a book based on a long railway journey. In 2006, Theroux retraced the journey, finding that people and places had changed, and that while he was famous for his earlier work he was not recognised in person. His account of this second journey was published as Ghost Train to the Eastern Star. ^ "The Great Railway Bazaar: By Train Through Asia". The Travel Magazine. 2008-03-27. Retrieved 2018-07-02. ^ "A Certified American in a Highly English Mode". archive.nytimes.com. Retrieved 2018-07-02. ^ a b Theroux, Paul (2013-05-30). "Paul Theroux on The Great Railway Bazaar – Guardian book club". the Guardian. Retrieved 2018-07-02. This article about an India-related book is a stub. You can help Wikipedia by expanding it.